The "Genjokoan", or the Koan of Everyday Life, is one of the finest writings on Zen by 13th Century Zen Master Dōgen Zenji, the founder of Soto Zen in Japan. This important piece is quite short but manages to contain in poetic form the central pivotal teachings of Zen: the beauty yet impermanence of life; the necessity of meditation even though everyone is uniquely awake already; the incompleteness of the human point of view no matter how advanced -- and more. 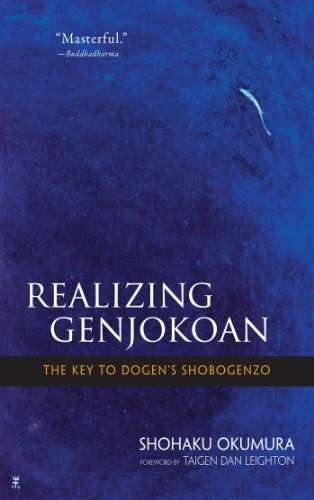 Although it is challenging, studying the Genjokoan strengthens Zen practitioner's understanding and resolve. It is an Intermediate Level course, appropriate for those who have taken the Introduction to Zen series, or who have had meditation experience. Taught by senior practitioners: Kogen Glen Duval, the Tanto/Head of Practice of HZC; and Rev. Yazan Dave Johnson, a Zen Priest & scientist. Each class begins with a period of meditation. The text for the class Realizing Genjokoan, by Shohaku Okumura is available for purchase at the Center.